Their children hunted. Their home seized. Their land threatened. 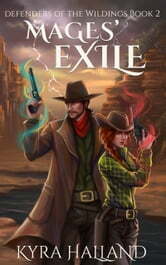 Once, Silas and Lainie Vendine, former bounty hunters turned renegade mages, had a home and ranch of their own and a position of respect in the town of Prairie Wells. Now, mage-hating foreigners have driven them from their home. But the Chardonikans want more than Silas and Lainie's ranch. Though they deny that magic exists, the foreigners are after Lainie and the children, Wildings-born of mage blood. When their retreat from Prairie Wells turns into a flight for their lives, Silas and Lainie seek refuge in the forbidden canyonlands. But it isn't only their family who are threatened by the ruthless, powerful Chardonikans; all the mages who make the Wildings their home and even the very magic of the Wildings itself are endangered. With the Chardonikans intent on tearing their family apart, Silas and Lainie must find allies and discover the true nature of their enemies if they are to have any hope of fighting back and protecting the people and magic of the Wildings. Mages' Exile is the second book of Defenders of the Wildings, a follow-up series to the western-inspired fantasy series Daughter of the Wildings. It is a self-contained series and can be enjoyed even if you haven't read Daughter of the Wildings.